H. Milano Mellon, M.D. earned his Bachelor of Science Degree in Biology from Fisk University and his Medical Degree from Meharry Medical College. He completed his post graduate training at L.A. County USC Medical Center. Dr. Mellon is a former Vice Chairman of the Dept. of Medicine and Medical executive committee member at Daniel Freeman Hospital. 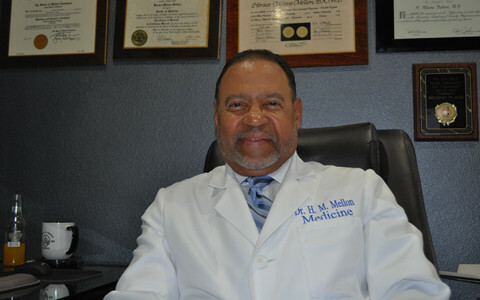 He was formally treasurer and board member of the Charles Drew Medical Society and President of the Inglewood chapter of the American Heart Association. 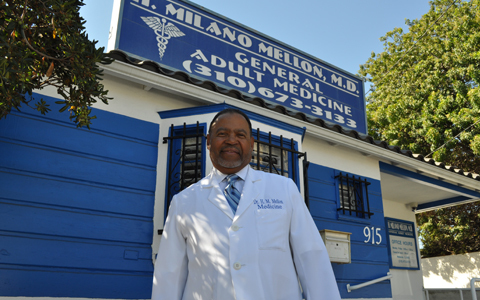 Currently, Dr. Mellon wears many hats as an Associate Member of the American Academy of Family Physicians, and a medical staff member of Cedars Sinai, and Centinela Hospitals, all while maintaining a private practice in Inglewood, California. Aside from his thriving medical career, Dr. Mellon is also the President and CEO of two rental management companies, East Regent Properties LLC & Myrtle Properties LLC. He’s a singer song writer and recording artist. Let us assist you to keep you in good health and well-being with our prompt service and caring staff.